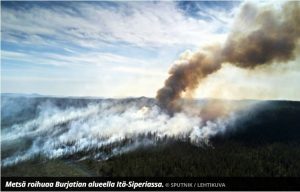 Seura published an article about Russian environment- “Venäjän metsäpaloissa pääsee ilmaan mustaa hiiltä, joka nopeuttaa ilmastonmuutosta – ”Palokaudesta tulee hyvin vaarallinen”” (In Russian forest fires black carbon is released into the air, which speeds up climate change – “Fire season becomes very dangerous”). The fire season starts already in February and lasts for months. In addition to the forest, peat bogs dry. In the fire, carbon dioxide and black carbon are released into the air, which is the third largest source of climate change after carbon dioxide and methane. Black carbon is thought to cause up to a quarter of global warming in the Arctic. Climate change has accelerated further still due to black carbon. In Russia, the Siberian permafrost melts, and dozens of large craters have been created in the tundra, which are likely to cause methane explosions underground. The article contains a commentary on the issue by Veli-Pekka Tynkkynen, read it here. This entry was posted in 2018, Media on 24.7.2018 by Elena Gorbacheva.